have a blowing feel very close to that of the standard bassoon. Instrument makers of the late 17th century took up the Renaissance tradition to build instruments of different sizes and pitches to form whole families and used this approach in the making of curtals (called „dulzian“ in Germany) and bassoons (called „fagotto“ in Italy) to build higher-pitched instruments. Some of these small bassoons dating from that period are exhibited today in a number of collections of musical instruments like the Musikinstrumenten-Museum Leipzig. But even at that period the size played most was the instrument pitched in the eight foot register which corresponds to our modern bassoon. This preference was largely fostered by the musical practice of basso continuo, i.e. thorough bass playing. The emergence of the symphonic orchestra and its scoring traditions which grew ever more popular caused the great diversity among musical instruments to dwindle in the course of the 19th century. Among bassoons, only the bassoon proper and the double bassoon were vigorous and indispensible enough not to fall by the wayside. The smaller bassoons of higher pitches and softer sounds as a result of their size had to make way for other instruments which were louder and better matched to the dynamic requirements made on orchestral instruments of that period. We offer small bassoons, i.e. fagottini, which match the physical needs and constraints of children for hire or hire-purchase whichever you prefer. The point is to encourage children to take up bassoon playing already at a young age and to make the substantial cost for acquiring such an instrument more manageable. Our monthly rate for hire/hire-purchase is € 30,- (as of January 2008 including 19 % German VAT). This rate is higher than the one offered by music schools which can fall back on public subsidies but is clearly below a rate which, calculated realistically, also covers all conceivable expenses caused by necessary overhauls and repairs. We check the instruments and deliver them in perfect condition. Most of them are either fresh from the maker or have been overhauled thoroughly and are supplied with the necessary accessories and a reed in playing condition and matched to the respective instrument. 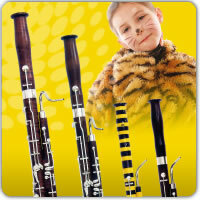 Extra reeds can be bought from us. The instrument needs to be handled with care to ensure that the instrument will keep its value. Parents are asked to take their share of responsiblity, for instance, by monitoring their children that the instruments are aired on a regular base and by helping them to assemble and disassemble the parts of the instrument in the early learning stages when children need to practise at home. With proper care, the instrument will not have to be sent in for a minor overhaul and inspection to the tune of € 250.00 any earlier than every other four to five years. This cost has been included in the monthly hiring rate. However, the hiring party will have to bear the cost if the instrument is lost or damaged and to pay for major repairs and general overhauls which are necessary due to improper handling of the instrument. Music schools responding to the emerging need for such instruments find hire-purchasing a practical way not to overstretch their own ressources and financial plans when buying new instruments. By the end of the year, any identified reserves in funds can still be allocated to invest in purchasing new instruments. Our hiring offer does not mean that you are obliged to buy the instrument. If you buy the instrument within 6 months after commencement of the hiring contract we shall credit the hiring rates paid so far at 100 % to the purchasing price. This corresponds to a loan without charging interests. If you buy within 12 months after commencement of the hiring contract we shall credit the hiring rates paid so far at 80 % to the purchasing price. This corresponds to an interest rate of 2.4 % per year. If you buy within 18 months this corresponds to an interest rate of 4.2 % /with 65 % of the hiring rates paid so far credited to the purchasing price). If you buy within 24 months to an interest rate of 6.0 % (with 50 % of the hiring rates paid so far credited to the purchasing price). The applicable purchasing price corresponds to the price specified as the listed price of the manufacturing company Wolf, Kronach, Germany, as the insured value in the hiring contract at the time of hiring commencement. Our offer is valid only within the framework of our financial ressources and, therefore, it is restricted. Your request will be answered without delay.